Gilded Books give me such a thrill... they bring back memories of my Pappa's bible that had beautiful gilded gold edges... I used to thumb them as a child... so soft and yet GOLD! 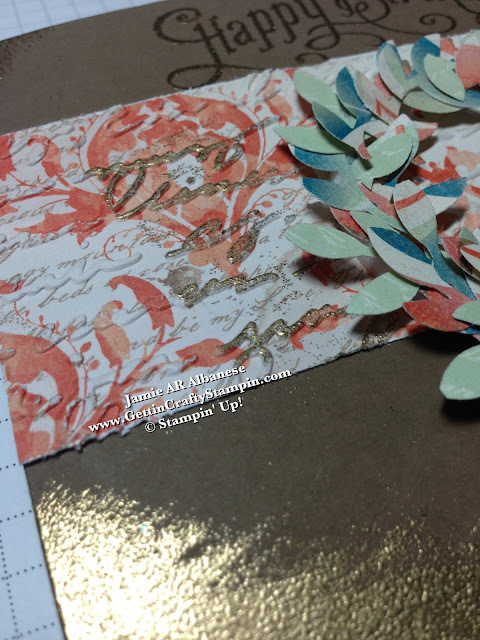 Using the Venetian Romance Designer Series Paper (#130144) for inspiration and embossing it with my Big Shot Die-Cutting Machine* (#113439) and Pretty Print Embossing Folder (#132175 Holiday Catalog). The written and textured script is oh so lovely! *Join my Big Shot Club (starting October 3rd) and Take Home $150 in Big Shot Goodies, TONS of PDF's, Lessons and FUN... you will be a Big Shot Pro!! Or CLICK HERE to see how to get the Big Shot 1/2 Off or FREE as a Hostess!! 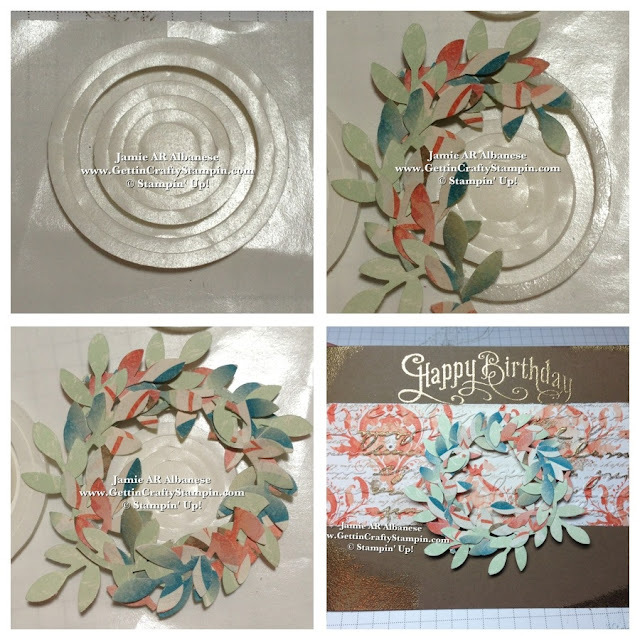 Want to create a 3D Wreath?? Grab our Shaker Frames (#124115) and this patterned Venetian Romance paper, Bird Builder punch (#117191) for these multi tonal leaves (very Fall, yes??). Rubbing my Versa Mark pad (#102283) across the edges and corners, across the raised embossed print and Heat Emboss GOLD (#109129) and set with the Heat Tool (#129053). 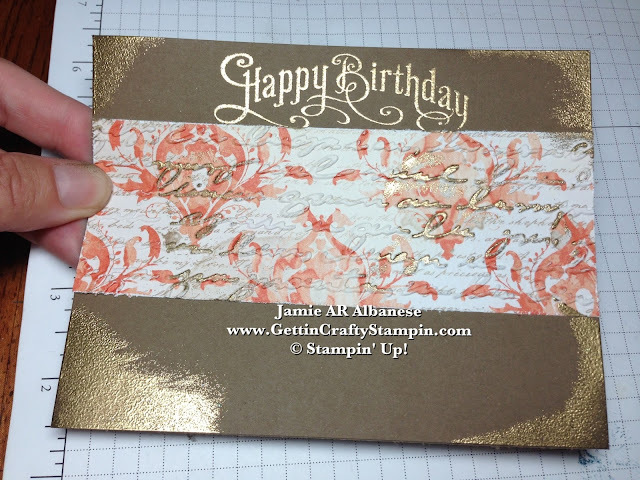 Adding a Perfectly Penned (#122892) stamped Happy Birthday in Gold embossing for a raised banner look. Gold looks so sharp on this Soft Suede card (#115318). Gilded Soft Suede embraces a Fall Elegance, doesn't it?? 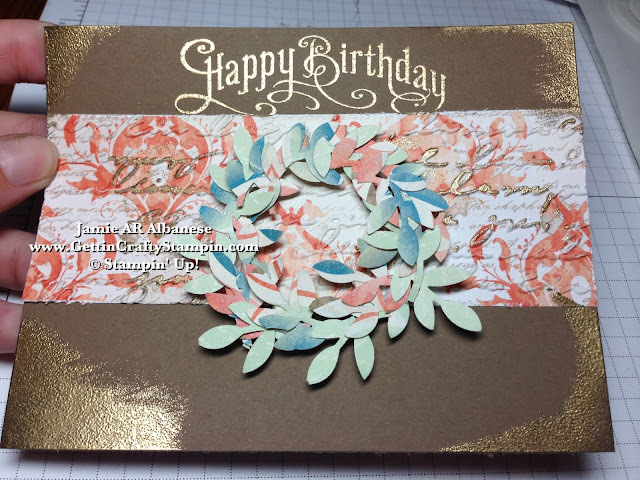 This Wreath lays perfectly under the Happy Birthday banner wish... vintage elegance with dimension!! 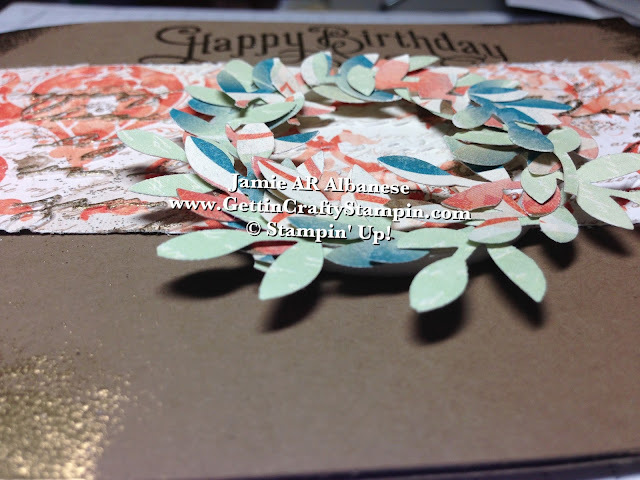 The Shaker frame holds these leaves in a circle shape, overlapping for a real wreath look!! 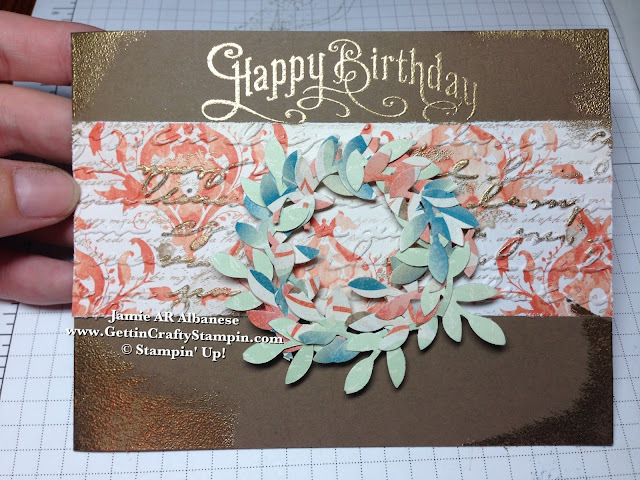 Italian Gold is sought after... here this card brings Vintage Italian Design, Texture, Gold... a rich card that doesn't cost much to make!! From the Gilded Age to Gilded Edged Books... vintage elegance is easy to capture. Send someone a Warm, Rich Birthday Wish this Fall!! Thanks for joining me with this rich card! !